Wooden toys that are entertaining, engaging and educational too are just what babies and toddlers need. This Artiwood Activity Stacker ticks all the boxes and makes learning with play tons of fun for little ones, with the 5 sequential sized boxes that each have a different activity to engage their senses and build skills. Artiwood wooden toys are not only tons of fun and educational but are also, built to last from quality wood and with non-toxic paints. 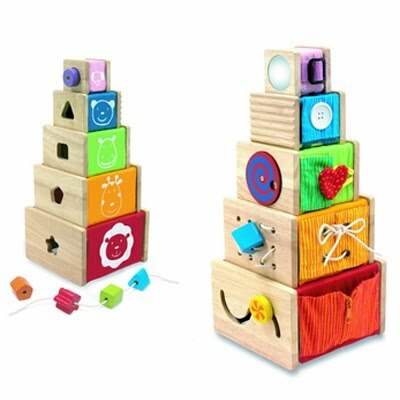 The wooden Activity Stacker is a wonderful first toy for babies and toddlers with 5 sequential-sized boxes, each with a different activity and plenty to keep kids engaged without being over-stimulating. Made from sustainable wood and finished with non-toxic child safe paints. The fabric is also removable to make cleaning easy. This activity stacker will be a much-loved toy with your baby or toddler and will have something to keep them entertained whenever they’d play with it. Whether the play safe mirror or the belt buckling or washboard scratching, there are loads of engaged play opportunities with this versatile toy. Plus, kids love stacking, sorting or nesting the sequentially sized boxes! The Artiwood Activity Stacker is a fantastic learning toy for toddlers too and improves both fine and gross motor skills, logical thinking, problem solving and offers sensory play opportunities too.